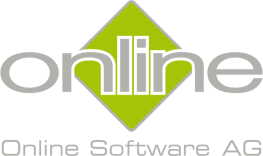 Online Software AG makes all reasonable efforts to provide correct and complete information on this website. The Online Software AG takes over, however, no liability or warranty for the actuality, correctness and completeness of the information made available on this website. This applies also to all links (“Links”), to which this website refers directly or indirectly. Online Software AG is not responsible for the contents on the websites reached through these links. The information on this web site is subject to change without notice. The content of this website is copyright protected. Online Software AG grants you, however, the right to save and reproduce the entire text or parts of it. For copyright reasons storing and duplicating pictorial material or diagrams from this website is not permitted. It’s essential for all links: We don’t have a stake in design and content of the linked sites. Therefore we explicit distance our business company from all contents of all linked sites in our website.